The bread slicer machine TPC+EBS is as semi-industrial model than can slice all type of breads (tinny bread, country bread, buns, loaves, etc...) with feed of them by lower conveyor and up conveyor to go with, which it is obtained an automatic and continuous process of fast, effective and perfect cutting. 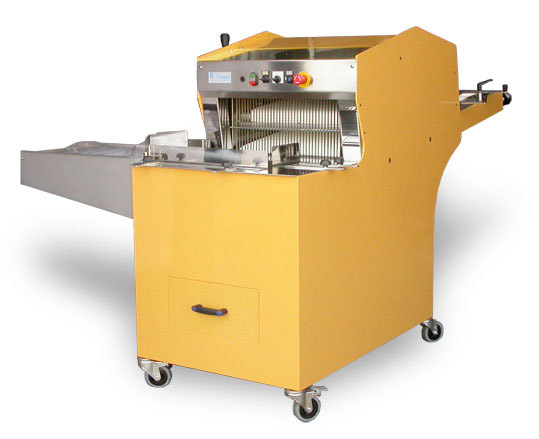 The bread slicer TPC + EBS machine it is made in three different versions of 43, 53 and 60, which permit slice up breads which their maximum length is 40, 50 and 60 cm. different size of breads and also to the drag on the breads was optimum. With two independents motors for the slicers and the conveyors belt. High quality of blades. With positive incidence angle between the blades and pieces to cut, obtaining a soft and cleanest and more perfect cutting. breads. Suitable converyor’s belt material to the stick-on of the breads. Regulable side guides so the breads will be well taken to line towards the blades.